Forgiving Mother: A Marian Novena of Healing and Peace is a beacon of hope for those who suffer the woundedness resulting from mothers who are troubled, either through abuse, negligence, mental illness, addiction, or emotional trauma. Part memoir and part spiritual guide, Forgiving Mother leads the reader deeply into the heart of Mary and step by step, into forgiveness, healing, and peace. Are you broken by woundedness which keeps you from attaining peace, happiness and the full potential of God’s will for your life? Are you ready to “be well”? Let Marge Fenelon be your companion to a full and healing relationship with God through the beautiful and salvific intercession of our Mother Mary. Coupled with therapeutic remedies, Forgiving Mother offers you practical guidance and spiritual wisdom born of Marge’s own personal experience to begin your journey to wholeness of spirit. Highly recommended! As someone who has struggled through the pain of broken relationships, Marge’s book is a breath of fresh air. It reminds us that most families are not exactly Norman Rockwell material. And while as Christians we are called to forgive, reconciling, even with those in our circle of family and friends, sometimes may not be possible. With the Blessed Mother as her guide Marge helps us navigate this emotional journey with hope that leads to the healing of our own wounded hearts. Forgiving Mother will lift your heart and soul from the pit of despair to the heights of heaven! Marge Fenelon presents a fascinating journey of a life affected by abuse and how she found comfort, hope, and peace through the compassionate, motherly love of Mary. You will experience the power of God’s love in a more meaningful way within the tender embrace of the Mother of Jesus. Forgiving Mother will inspire and encourage you to plumb the depths of God’s mercy in your own life, leading you to profound healing and deeper intimacy with the Lord through the heart of His Blessed Mother. This book will be an invaluable asset for those who need to forgive and be forgiven. Marge had courageously shared the story of her painful childhood experiences in order to bring others an awareness of a path for healing. Seeking the assistance of the Blessed Mother’s guidance in prayer, Mary affirms all her children as they unite their experiences in a deepening relationship with her Son. An extraordinary work and a great gift to the Church, Forgiving Mother will help you to heal from the past and live in the fullness of God’s plan for your life. In this incredible book, Marge Fenelon shares with us her touching story of healing and forgiveness. Containing wonderful insights from one of the holiest priests of the 20th century, Fr. Joseph Kentenich, Marge’s story is a testimony to the power of Marian consecration and the rosary. 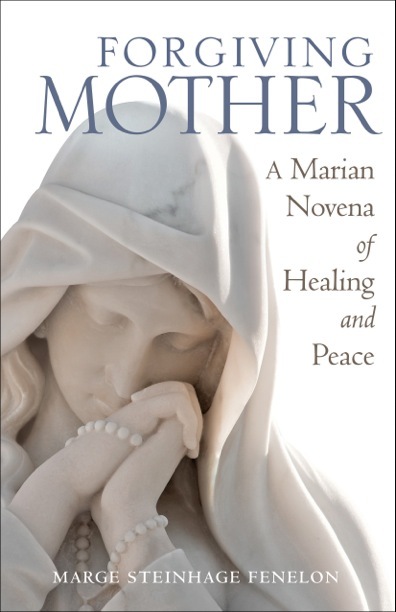 Pray the novena in this book, and allow Jesus and Mary to heal you, too! Yes, Mother Mary always leads us to Her Son Jesus. When a bride and groom were without wine at the wedding feast at Cana, Mary said, “Do whatever He tells you.” She is forever leading us to Her Son. Allow the author to take you by the hand through the pages of this book and lead you into something quite magnificent. I know that you will be glad that you did. I can guarantee it. I also believe that Forgiving Mother will edify any reader, helping them to understand the need to love and nurture one another as well as learn more about Mary’s essential role in our lives. **No PayPal account? No worries. Email me at marge@margefenelon.com and we’ll arrange another method of purchase. ***Send personal inscription requests to marge@margefenelon.com. This is a well-written, book that would be of interest to anyone who has someone they need to forgive. Great work!